Lower level unit. 200 yards to Oma's Meadow. Very, very nice unit...qualifies for Deluxe but owner rents for Comfort price. Free WI-FI. Lower level unit. 200 yards to Oma's Meadow. FULL bed (not alcove) Free WI-FI. Lower level unit. 150 yards to Oma's Meadow. Free WI-FI. Loft unit on top floor of Building 11. Nice corner unit with Queen bed in loft and Queen sofa in Living Room, stocked with a bumper pool table and an x-box. Free WI-FI. Walking distance to the ski slope. Lower level unit. 150 yard walk to Oma's Meadow. There are bunk beds in hall, but they are best for children under 5 feet tall. Free WI-FI. Top floor corner unit. 200 yard walk to Oma's Meadow. Short bunk beds in hallway, queen in bedroom and queen sofa bed. 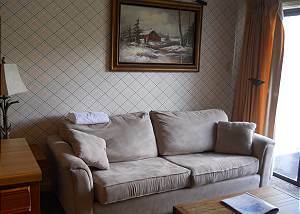 Comfortable for 4 adults or small family. Free WI-FI. Mid level end unit. 150 yard walk to Oma's Meadow. There are bunk beds in the hall, but they are best for children under 5 feet. Free WI-FI. Top floor unit. Queen bed in loft. Free WI-FI. Walking distance to ski slope.